This is the version of the film I have been waiting for. 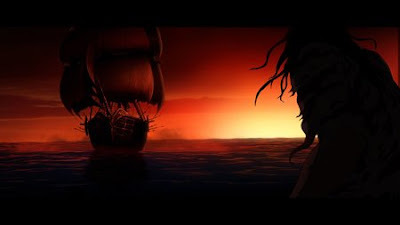 It has Tales of the Black Freighter added into the film making it even closer to the original graphic novel. Warner Bros. will release the 5-disc DVD ($43.87) and 4-disc Blu-ray ($59.99) editions of Watchmen: The Ultimate Cut on 3rd November for a limited time with apparantly only 70,000 units being produced. However, I am sure they’ll end up making more. 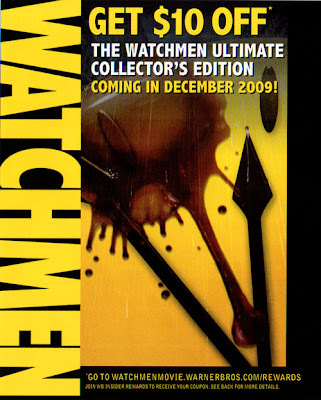 Watchmen: The Ultimate Cut, is out on 3rd November2009. Will you be buying it? 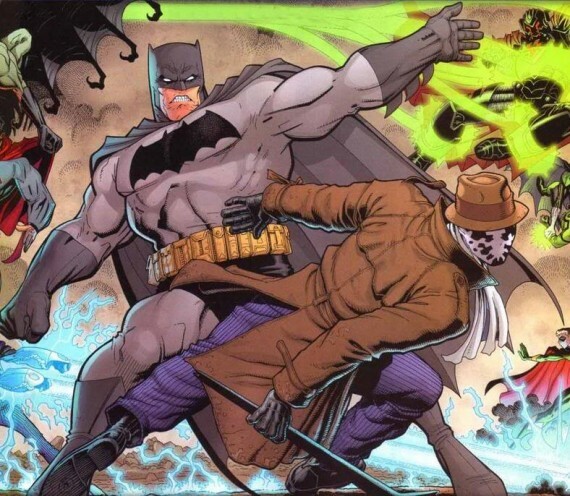 This is a better version of the deleted scene that will feature in the Watchmen Director’s Cut. It shows the death of Hollis Mason, Nite Owl I. You can get the Director’s Cut for Watchmen on DVD and Blu-ray on July 21st. If you go and buy the Watchmen: Director’s Cut on Blu-ray Disc that is all well and good. It was a film I really enjoyed and it will be great to see the extra scenes edited into the film. Below is the scene of Hollis Mason’s death. 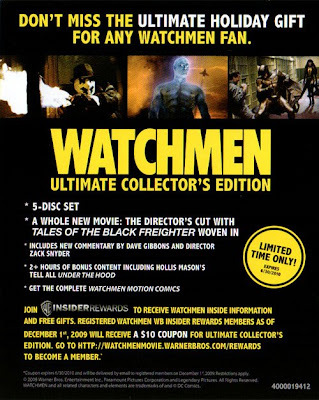 However, HDR spotted a flier in the pack that gives $10 off the upcoming Ultimate Collector’s Edition of Watchmen. It is due out in December and will span a 5 discs. The director’s cut set is three discs, one of which is dedicated to the standard definition digital copy. The Ultimate version will have a new commentary track from director Zack Snyder and Dave Gibbons, 2+ hours of bonus content including Hollis Mason’s Tell All “Under the Hood,” and the complete Watchmen Motion Comics. If you play it with the sound off you have Alan Moore’s commentary track! 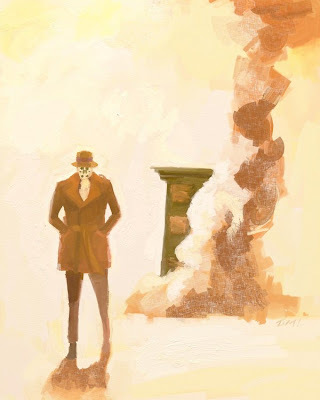 Tales of the Black Freighter will be “woven into” the director’s cut of watchmen for an all-new creative cut of the film. It also features the complete Watchmen motion comic. What cut of the film will you be picking up? MTV Splashpage had these cool looking images from the forthcoming Watchmen: Tales of the Black Freighter DVD. 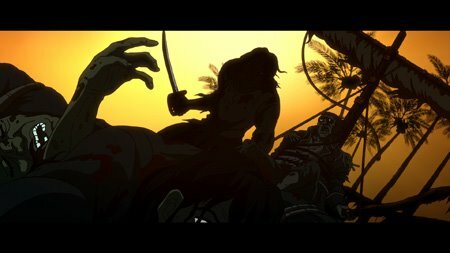 There will be a super deluxe directer’s cut version of Watchmen with this animated segment spliced in. 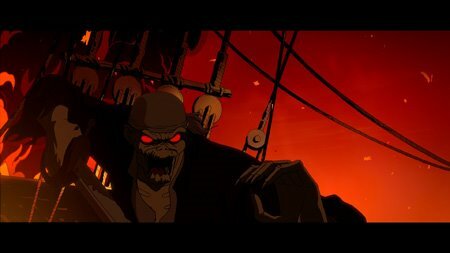 “Watchmen: Tales of the Black Freighter” — features the vocal talents of “300” star Gerard Butler — ships out tomorrow on DVD and Blu-ray, and includes the Minutemen pseudo-doc, “Under the Hood,” starring the cast from the film reprising their roles as the original do-gooders gone horribly bad. Along with the headlining movies, the 2-disc set also includes a first-look at “Green Lantern: First Flight,” and bonus featurettes “Story Within a Story: The Books of the Watchmen” which explores the comic-within-a-comic of “Watchmen,” “The Why of the Watchmen” by Zack Snyder, and “The Two Bernies” showing a scene from “Watchmen” not seen in theaters (the latter two only available on the Blu-ray edition of the set). 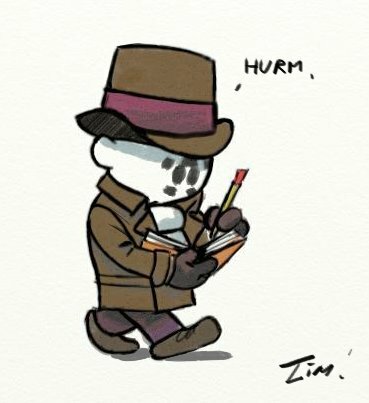 Rich Johnston over at Lying in the Gutters had this little piece of info regarding the Watchmen DVD. Dave Gibbons confirmed to a packed audience at a Borders bookstore this week that he has already completed his DVD commentary for the mega-directors-cut of “Watchmen” that includes the “Black Freighter” story integrated into the main film. Maybe we can expect the finished product sooner rather than later? io9 have posted a load of Easter Eggs from the opening credits of the Watchmen film. They also include some bits that had to be cut, but that may be on the DVD. The one above is my favourite with the first Nite Owl punching out a criminal and saving a smartly dressed trio on the left. Could it be Alfred and Martha and Thomas Wayne? 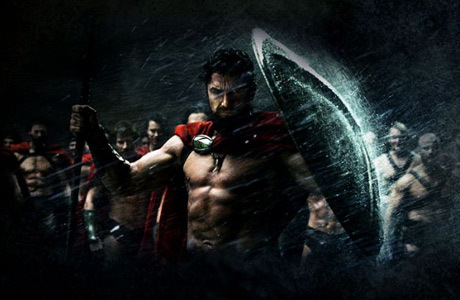 What other cool things did you spot in the opening credits of Zack Snyder’s Watchmen?